Since we now have all these random days to celebrate like National Donut Day, National Boyfriend Day, etc. we basically get to celebrate something every day of the year. October is Pregnancy and Infant Loss Awareness month. I also just read that it is also AAC Awareness Month. These two subjects are very near and dear to my heart. 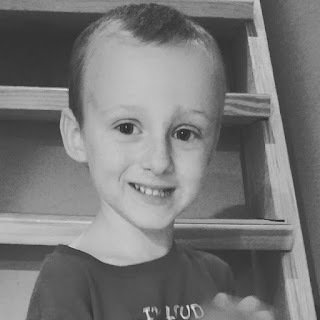 I want to talk about AAC Awareness month today. 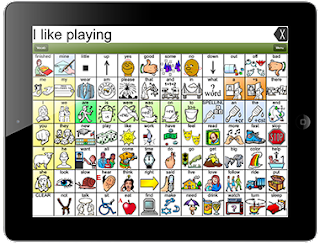 AAC stands for "Augmentative and Alternative Communication." AAC is basically anything that you use to communicate that isn't speaking. Writing, signing, gesturing, facial expressions, picture exchange, or a device like Colin uses. This particular incident made me realize that I need to step up my advocacy game and educate. Colin's uses an iPad as his communication device. We bought the app LAMP Words for Life by Prentke Romich. You can view it here. Here is the link to it in iTunes: LAMP on iTunes. And just FYI - it is only $150 today (Oct 6, 2018). We paid $300 for it last spring! I was packing Colin's school bag the other day. I couldn't find his device. It had just been on the ottoman, where in the world had it gone? My mother-in-law and I looked everywhere. It was gone. I thought I was losing my mind. Colin had just had it because he asked to go downstairs....I went downstairs, and there it was: he had carried it down there with him, and it was right there with all of his toys. I just love that he wants his device. Right now, it is his voice. I encourage all of you to see AAC for what it is - communication. It doesn't matter how we communicate, what matters is that we can communicate. If you can speak, good for you! But for many people, speaking is difficult, or even impossible. I am so thankful that we live in an age where we have so many communication options available to us and those we love.